Do you have knowledge, taste, or style? Back in June, standing in Pisa airport with Luke, we considered the dozen or so buyers and journalists we knew who had been on the same flight. Then there were those that, despite not wearing particularly expensive or well-made clothes, looked good because the pieces had been well chosen and assembled. This is the most common type among the English: men with taste. You’d put money on the fact they also had beautiful upholstery at home, and knew at least a few William Morris patterns by name. Finally, there were one or two men who just had style. Their clothes weren’t necessarily well-made, or tasteful, but the way they wore them almost overcame all that. It was an attitude, an angle, a gesture. Most of them looked a touch Italian. If this were a Venn diagram, there would be a few acquaintances in the overlaps: those with both knowledge and taste, for example, but not much flair to it. And there would even be the odd person – perhaps just one (we will spare him the embarrassment of being named) who sat square in the middle. Who had all three: knowledge, taste and style. They are very different attributes, and ones that different people aim for with different levels of success. But they should not be confused with each other. Of course, as so often happens, we later remembered that someone had put better than us about 50 years ago. As Hardy Amies said: “A man should look as if he has bought his clothes with intelligence, put them on with care and then forgotten all about them”. Here’s hoping Permanent Style helps with the first and second, and habit does for the third. You can follow the discussion on Do you have knowledge, taste, or style? by entering your email address in the box below. You will then receive an email every time a new comment is added. These will also contain a link to a page where you can stop the alerts, and remove all of your related data from the site. Refreshing to read reflections from someone with the credentials to know what he’s talking about. Mr. Crompton is one of the few legitimate experts in this field of luxury menswear. And a wonderful writer in the bargain. Having returned from Milan a few days ago I can say Italians do all three so much better than the English or probably every other nation in the world. For them it’s just natural, it’s second nature, there’s no trying too hard which you see so often on blogs / streets nowadays. And I’m not talking about all the well known Italians seen all over the Internet (as those quite often seem ‘fake’ in a way, at least to me), just simply Italians on the streets. Maybe you’re mixing in the wrong circles, Tom! Seriously, I think British style (i.e. the style of dressing) is the best in the world. Pity so few do it well these days! The average Londoner dresses abysmally. The aristocracy (or what remains) are a universe away from being the style arbiters that they once were. I’m biased, but I still say that a well-dressed British gentleman is a sight to behold! Look carefully and you’ll still see them in London. That’s if you’re not distracted by the dandy-ish clown walking past him. Any clown can ‘dandify’ themselves with loud, eye-catching clothes and flashy accoutrements. The greatest men’s style is much more refined and sophisticated than that. It’s more understated and it takes a sharp eye to appreciate it. I don’t claim the Brits are better than anyone else in their dress, but they have gravitas and understand formality as few others do. 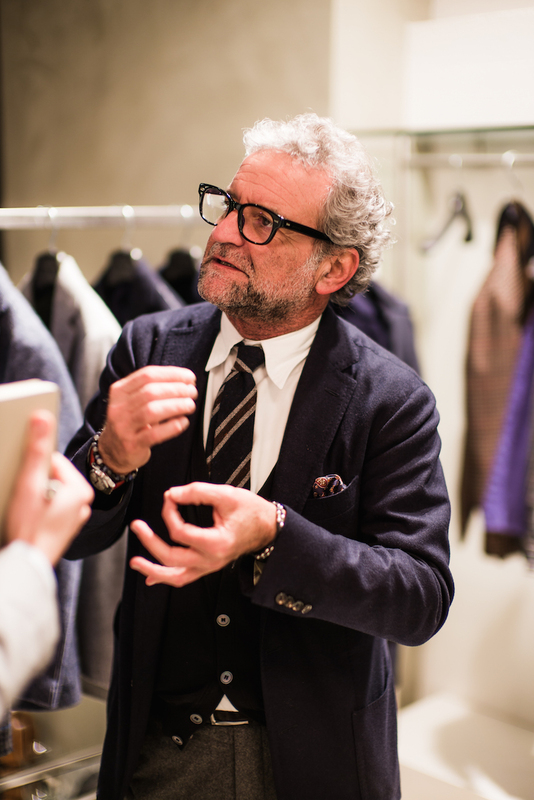 I love the way certain Italians dress, but a well-dressed Brit is still a sight to behold. The Italians are definitely better-looking, though! Sorry, meant to delete most of that. The tiny comment box means you can’t see what you’ve written already! La-di-da. I agree with Mac on every account with the possible exception of the last line. Our Italian brethren get a lot of play but personally, in the round, I find them a little gallous. The French, on the other hand – although little discussed in these column inches – are, when they get it right, pretty damn perfect. But, the English, although few in number are the gold standard. As somebody who has been ploughing this furrow since he saw Dr.No in 1963, I would say if you are interested in style, you can make it happen but it is a journey rather than a destination and the good news is, the older you get the less mistakes you make. This is a very interesting post! My comment is a quick one, just aimed at acknowledging that. I’ve been musing over it since I read it! This is why I enjoy Permanent Style. Simon – it’s obviously your blog and therefore your prerogative to write about exactly what you wish to write about, but while I find the pieces on various high end bespoke purveyors of luxury apparel very interesting, it’s the pieces on how to put it all together (whether using those luxury pieces or more affordable items) that I find really engrossing. Please keep up the good work! It’s so subjective though isn’t it? Look at your recent posts on your own outfits! I guess it takes many years before someone can truly be considered hugely stylish. Hi Simon, great piece, and very true. Since you mention Pisa, I was wondering whether you had any recommendations (tailors, shops, etc.) in Tuscany (apart from Florence, obviously), possibly in the Pisa/Lucca area. Good disquisition about taste and style. To me, style is a mind disposition, knowing what you are wearing, why you are wearing that, but feeling comfortable and totally confident with that, whatever it is. I have an idea for an article: The relationship between the collar and the gorge placement on the jacket. For example, I really like it when the tip of the collar is allianse with the gorge. Do you have any thoughts on this? I’m back with a question, Simon. Whereas I understand that style has presumably more to do with personality, I just wonder whether it’s totally disconnected with taste. Anyhow there must be a sense of taste, no matter its amount, to make being stylish display such a consistency associated, at least to my mind, with it. Out of the three, perhaps the quicker one could acquire is knowledge. Yet acquiring all of them requires a … looong journey! Fortunately, we can rely on PS! I thought I’d wade in with my 2 pence on an excellent post. As has been acknowledged, style is subjective, but is not as closely linked to taste and knowledge as one might think. Plenty of my friends who don’t have particularly great taste (lacking knowledge of the finer details of ‘menswear’ and an eye for colour etc) can recognise someone with style, because that individual carries themselves differently and whatever else identifies someone as stylish. So Simon’s use of the Venn diagram instead of a hierarchal system is very accurate. However, we should not ignore context when judging another’s style credentials either. If we were to only meet a man once, dressed impeccably showing great taste and knowledge, but looking broken, it would be unfair to forever discount him as lacking style henceforth. Granted, this is probably starting to move away from Simon’s original idea for the post, but let’s not forget that we should try and embrace the people underneath their clothes too. As to the 1st comment / question: isn’t there a wiggle room for him and presumably many others? I wonder if many readers decided to purchase, say, a RTW jacket ( of level 3 + just indispensable handwork) , couldn’t they join their efforts and order together the desired item at an affordable price? In the recent weeks, as I’ve been trying to find out a light brown Summer jacket in wool & linien, and eventually end up musing over that such an initiative could actually be of interest to many readers and hopefully doable. It’s something that lies behind all our collaborations on the blog, so yes it definitely can happen! That’s a way to get small runs of things made that otherwise wouldn’t be seen as economical by the manufacturers. But if you are just interested in chasing wholesale prices, then you’re onto a loser in the long run. None of the brands we feature here charge excessive margins. I’ve written about that a fair bit in the past, but can always do more. These are definitely good news, Simon! Perhaps, it would be worth dedicating an entire post on this kind of this kind initiative PS’s readers could envisage. It would be really helpful to a great deal of readers. Thanks in advance. No offence to the ‘wholesale price-seekers’ but why should any craftsmen or quality maker lose their already small profit margin just so you can expand your wardrobe? There has to be some sizable benefit for them (i.e. a prominent journalist who might write about them). Close family/friends might also pay cost price. Few others qualify. The amount of craft and skill in such items requires a lot of time and hard work. Stop being so tight-fisted and just pay the bloody price! If you can’t afford it, then set your ambitions a little lower. Do you mean lower than a level 3 jacket? Mac – a consumer purchase at wholesale prices cuts into retailers’ margins, not makers’. My own view is that knowledge comes from study of the subject and experience through experimentation; does a particular tie lift a shirt/suit ensemble? This results in an understanding of the subject (what combination) and context (the environment – is the ensemble appropriate for the occassion and its surroundings). Construction, line, quality, fabric, history, origin etc. then become the building blocks of taste. Taste, particulary in the aesthetic, is developed through a deepening of appreciation; reading PS, understanding the approach of icons (Agnelli, Boyer, Kennedy, Grant, Amies etc), visiting the shops that sell quality items. Furthermore taste should be connected to fashion otherwise if too old or avant-garde it enters the realm of the antiquated or theatrical. Style is an expression of the first two, one cannot have style otherwise. Oddly style is both a unique expression (style is never uniform) whilst also being something that is universally recognized (no one ever said Fred Astaire was badly dressed). One last point is the influence of environment. Italy, in particular, has some of the finest art, architecture, gardens and design in the world, I think this influences ones approach – the same, as Mac points out, is also so for London. Once again Simon’s article serves both the practical and philosophical – thank you. What about an interview with Vincenzo Attolini? He must have something to say about the kind of subjects discussed here. Personally, I would be delighted to read what he has to say. Piece coming. Not on these topics, but I can ask him about that later too? Hi Simon and other readers, do you guys know which Italian tailors (suit or shirt) visit London on a roughly monthly basis? From your blog here I know Luca, Solito and Vergallo do, but anyone else? Thanks! Such a great question. I agree with BespokeNYC. Knowledge can be acquired – and with that knowledge will come “taste” – an understanding of form, function, design, cut, etc. which then becomes a sense of how to select, wear and combine and co-ordinate ones clothes. But, for me, style is innate, it is the ability to not follow the rules or to break them and still intuitively look “good.” It’s a sense of flair. Well-dressed Brits (and the French) will always be able to display “taste” in what they wear – but the Italians have more mastery over “style.” So, to answer the actual question posed, I might suggest that I have an element of knowledge and taste – but what I truly desire is STYLE! Interesting point. What everyone wants is style. But they usually ignore the necessity for knowledge and taste. Taste doesn’t necessarily arrive with the accumulation of knowledge, by the way. Taste, as used here, is an aesthetic sense, where knowledge is not. Nice to hear about the style of Italian men but as an Italian who spent many years in London I can say that I have learned from the English gentlemen (the real ones) the elegance of wearing hyper worn clothes, the charme of old well kept shoes, the joke and fun of socks with a hole on the heel under a perfect tailored pin stripe. And today I enjoy this lesson with my Italian bespoke suits made 20 years ago. I think it is worth bearing in mind that you and your reader’s (including myself) concept of a ‘permanent style’ consists of styles of dress developed mostly in the last century in one small part of the world. There is always a danger of becoming narrow-minded. In my mind style at its most simplest is the interplay of colour, texture and form (or fit) in an outfit worn ‘naturally’ and with confidence. I find embarrassing the obsession on many men’s style blogs with the idea of becoming a ‘gentleman’, almost always a seemingly Victorian paradoy, usually one step away from a monocle and a bowler hat. The worst are usually American. I think that the idea that a way of dressing instils any moral quality is problematic. Absolutely. And you’re right, it is always non-English people that find that idea of being a Gentleman (capital g) appealing. I find equally irritating the portrayal of such a man as being a cocktail-drinking, sports-car driving egomaniac (and usually, if the photography is anything to go by, a misogynist). I have used the word gentleman probably in an appropriate way (but I am not an English native speaker). I did not mean to refer to a lifestyle, social class etc. but just to people who care about dressing as such and not as a status symbol or for being fashion victims. Simon, I don’t recognise your description of a gentleman. To me, you’re describing a rake! Most people’s idea of a gentleman are quite similar. I’d say it’s someone who’s educated, who dresses smartly, has good manners and a sense of decency. The popularity of shows like Downton Abbey would suggest that we still believe in gentility – even when there’s less and less evidence of its existence. Interesting point about the potential negative connotations of “tasteful”. I often think that American men are a good example of this. Ignoring the oh-so obvious stereotypes about baseball-cap wearing schlubs, walk around the financial district of a city like New York or Boston and you’ll see most men in conservative navy or grey suits, black shoes, white shirt and neat woven geometric pattern ties. Not particularly interesting, but you’re much less likely to spot the type of blunders you get in London: overly tight suits straining at the waist, cheap, pointy shoes (often many shades lighter than the suit) and garish ties. I know what I’d rather see. I’ve been reading your blog for the best part of the last 3 years and have always found your posts interesting and very educational. I am intrigued how you can possibly invest so much into threads; it seems most of what you own is at the luxury end or bespoke including shoes and even jeans (probably even bags although I’ve not seen a post on this). In the past someone equally intrigued asked how you could afford such luxury and your answer was it was a matter of priority. I thought it was a great answer. But is dressing and clothes your main/only interest? Do you see it as an obsession?